I used to have the husband by my kids' side in terms of assignments most especially in Math. If there is someone they should call when it comes to graphical requirements and computer works, they call upon their Daddy to assist them. And now, that one moment has come when I needed someone to do the hard stuff for the kids, and I have no one but myself to do it. I must admit, since he left for work, I have had a few worries. That includes the task of refilling the water dispenser, fixing plumbing works and electrical wires and a few tasks only a strong man could do, (I'm such a weakling, aside from having backbone problems". 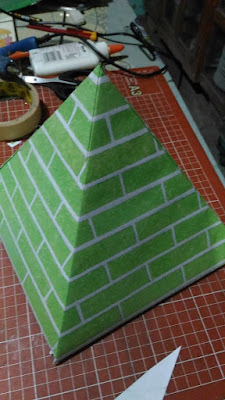 So for the last few requirements in school, my daughter was required to create a 3D image of a pyramid. When I learned about what the teacher wanted, I was not happy at all and was out of bounds on how to do it, in fact, it kind of scared me a wee bit. Forgive me if this blog seemed ignored for like a century already. 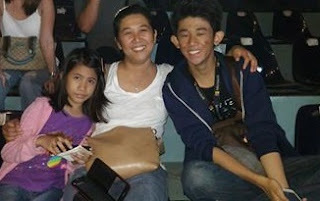 I have been so busy with so many things work-related plus the thesis and kids and house chores that need attending to. But seriously, there are a just a lot of things I have to be thankful for, like having wonderful children who help me cook breakfast in the morning, and a daughter who, while there may be tantrums at times, keeps me sane as she joins me in bed while her father is away for work. So, children. I have a 15-year-old son and a 10-year-old daughter and I am almost but not quite my forties. I have been very eager to watch Bamboo In Demand Concert here in Gensan because as many would actually know, I am such a fangirl of Rivermaya, a 90's band with Bamboo as the vocalist in their most famed years. Came Saturday, and I tagged the kids along with the hope that they get to enjoy Bamboo because they see him as a judge in The Voice, a singing competition aired over the TV on weekends.